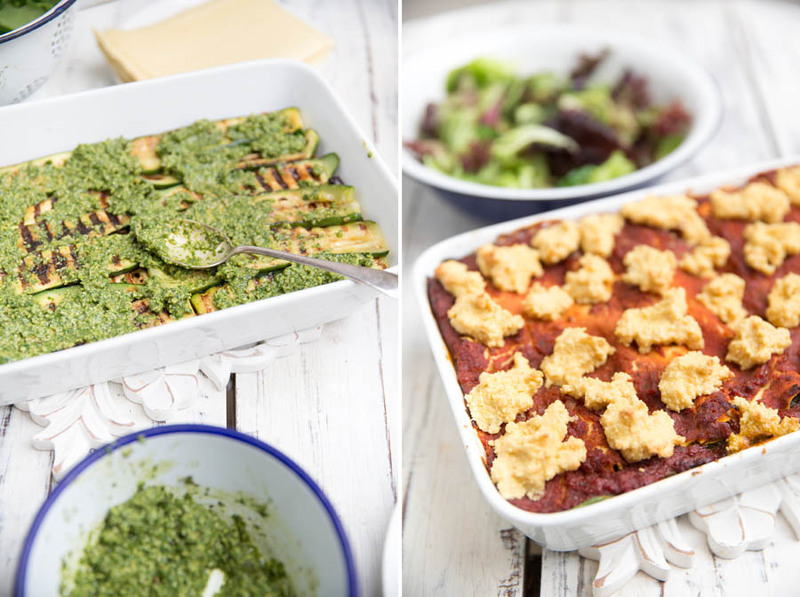 Veggie Lasagna – that rocks! 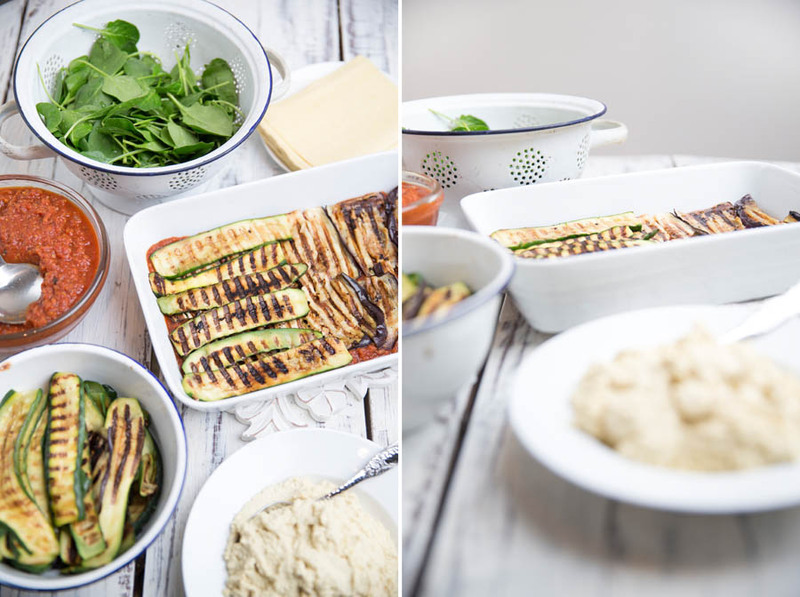 For those of you out their trying to reduce your meat and dairy consumption or simply introducing more plant based meals to your family this recipe is a winner. My “meat loving” hubby James has named this dish his new fav… so that is saying something. 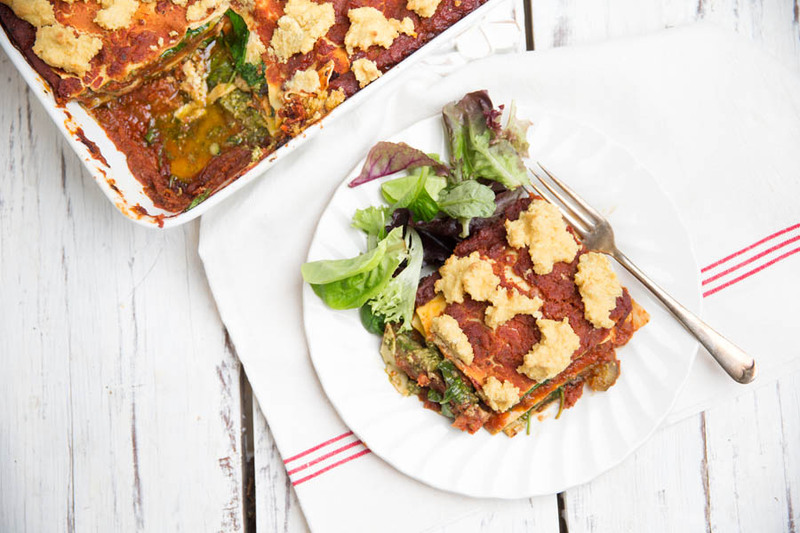 Veggie Lasagna - that rocks! Make the Veggie Bolognese sauce in advance by adding all the sauce ingredients to your slow cooker. Place on the lid and cook on low for 4 hours. Alternatively if you don’t have a slow cooker you can cook all the ingredients together in a large pot over a very low heat for 2 hours, stirring occasionally. While the Veggie Bolognese Sauce is cooking soak the macadamias and cashews in a glass jar covered by the filtered water. Make the Veggie Pesto by adding all ingredients to your food processor and combining on high speed until just smooth. 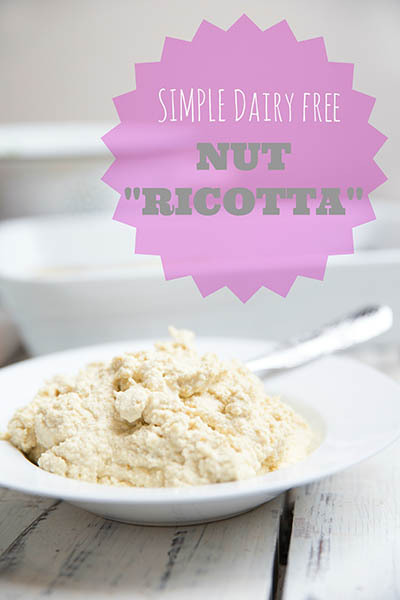 Set aside in a bowl and wash your food process for making the nut ricotta. Strain the water off the soaked nuts and add them to clean food processor. Add in the remaining ingredients and process until the mixture forms the texture of ricotta. Blend a small bit at a time so as to not over blend the mixture. Add a small bit more water, a bit at a time, if the mixture is too try. 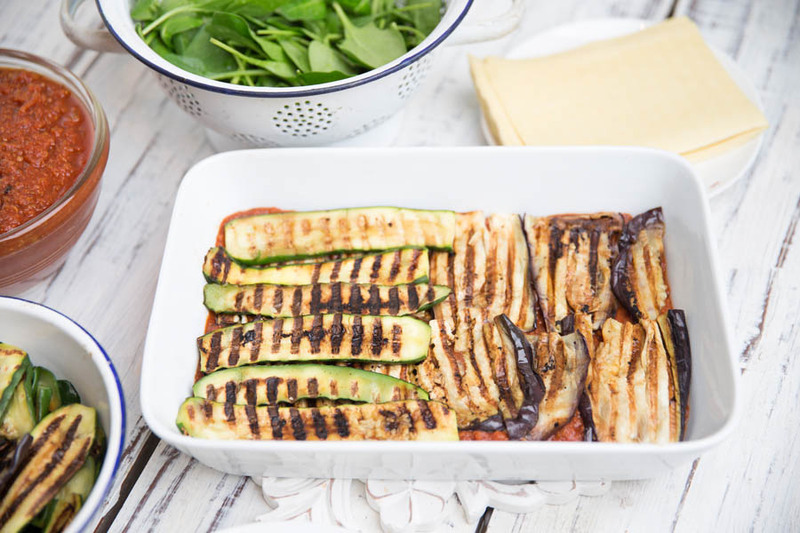 Slice the veggies into 1 cm slices and grill either on a griddle pan, BBQ or in your toasted sandwich press. I use my toasted sandwich press as the veggies cook on both sides at once and each batch only takes 5 minutes. 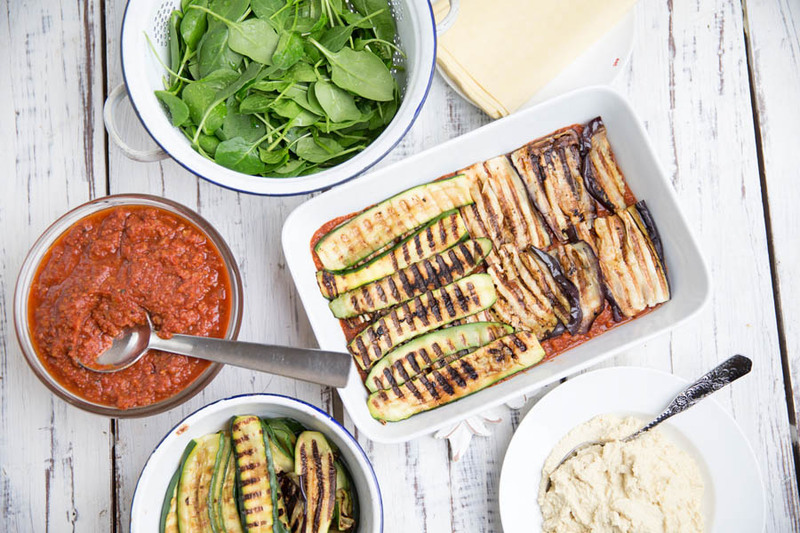 Assemble the Lasagna by layering the Veggie Bolognese Sauce, then a layer of grilled eggplant, a layer of grilled zucchini, a layer of pesto, baby spinach leaves and then the pasta sheets in a large baking dish. 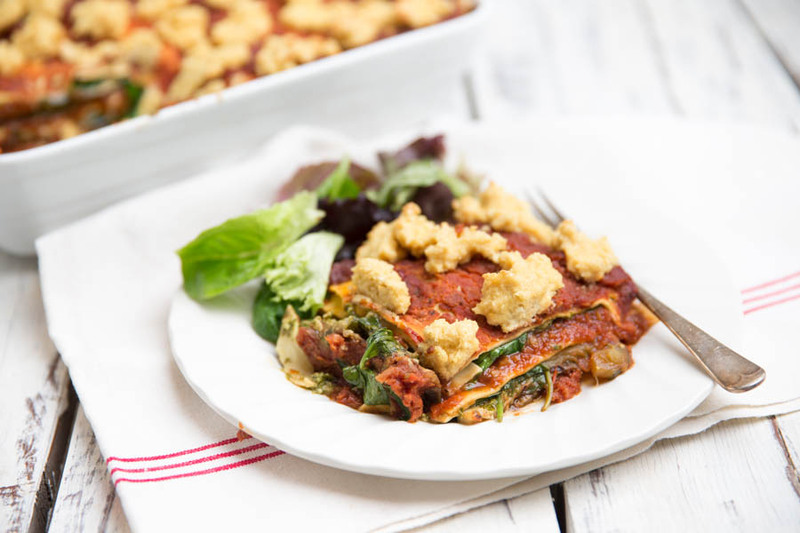 Repeat the layers until the dish is full to the top, finishing with a layer of Veggie Bolognese Sauce. Bake in a moderate oven (180degC) for 30 minutes. 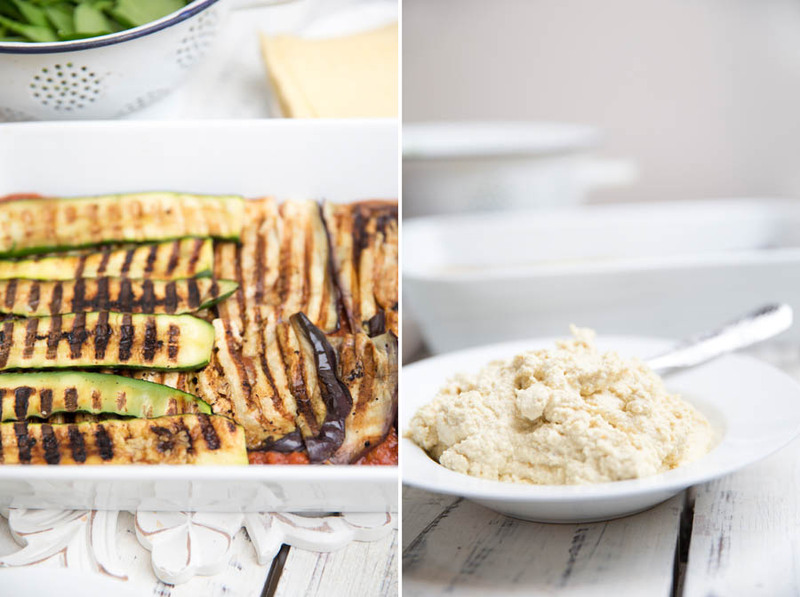 Take the dish out of the oven and arrange dollops of the nut ricotta all over the top. 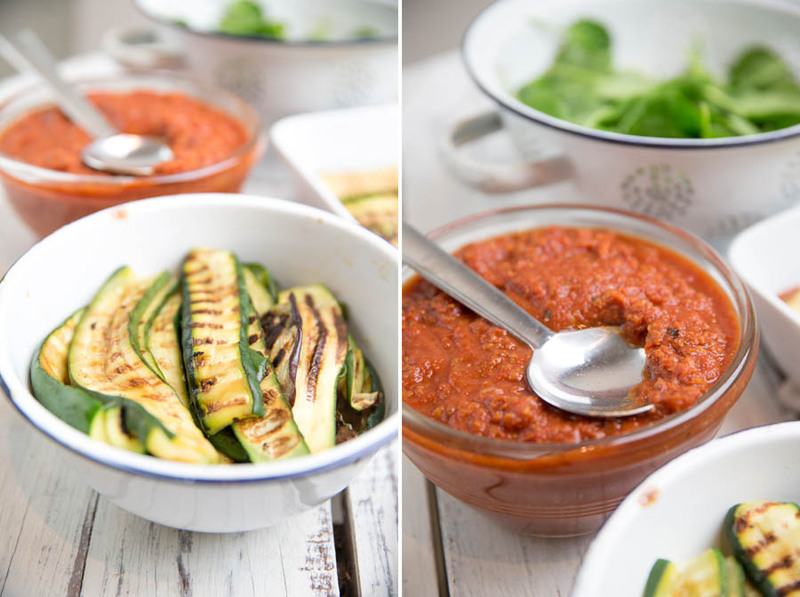 Serve hot with a simple side salad. Makes for great left overs but there is more likely not going to be any left… its just that yummy. Yum! That looks so good. I actually made a very similar lasagna last weekend. I’m obsessed with nut cheeses now, they’re such a great alternative to dairy. Thanks Deb. This recipe turned out great. It was my first time trying nut ricotta.